Specialized trail riding tack can be a real help for both you and your horse. If you frequently ride in the open, you will eventually find yourself eyeing some of this special gear. While some of it is just more functional when hacking out, other types of trail riding equipment is necessary in certain terrains. If you practice endurance riding or competitive trail riding, you are probably already very familiar with most of the specialized horse riding tack. Breast collars, saddle cushions, pommel and cantle bags, stirrup leather covers and cruppers are standard items when hitting the trail. Let’s talk about some of the available tack you may want to try. There are special saddles made just for trail riding. Many trail riders use endurance saddles, or tree less saddles. Generally trail models are super lightweight, offer security in the seat, and are designed to be comfortable for long hours in the saddle. They are generally made of synthetic materials, which makes them easy to care for and lightweight. Synthetic tack can be wiped or hosed off after use. This type of tack generally has many “D” rings for attaching breast collars, cruppers, cantle and pommel bags. A good, quality pad is essential for long hours on the trail. You don’t want to skimp here on saddle fit or your pad or you could wind up with a very unhappy horse. Breast collars are a necessity in your tack collection if you ride on hilly terrain. A breast collar is a piece of equipment that fits across the horse’s chest and attaches to the saddle on both sides in the front. It keeps your saddle from sliding back on the horse as you tackle hills. 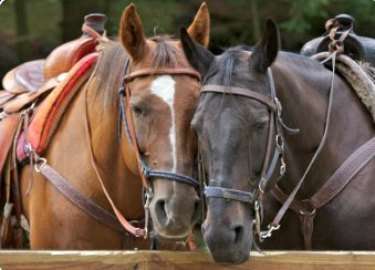 While some riders may use them on a horse who has high withers or one where the saddle tends to move while riding in the arena, they are much more common on the trail, and are necessary when riding in very hilly terrain. Halters and Bridles made specifically for trail riding can be made of synthetic, lightweight material or leather. Combinations of a halter which is used for leading a horse and the bridle which is for riding are common. This unique piece of trail riding tack makes it easy to stop and tie your horse along the trail with the halter built right in. Having a halter saves you from tying by the bridle reins which is not only dangerous for the horse but not as secure. If you tie by the bridle reins, he could pull back and do damage not only to the bridle but to himself. I have seen horses with only half a tongue because the bit cut it in half when they pulled back while tied by the reins. Use a halter/bridle combo or fit your horse with a lightweight halter under his bridle and bring a lead rope when trail riding. Cruppers are not as common as a breast collar but those that have had to use them know their worth! The opposite of a breast collar, a crupper attaches to the back of the saddle and then around the tail. It keeps the saddle from sliding forward onto the horse’s neck when going downhill. Cruppers are used a lot on mules, who have a narrower build and less withers (backbone) to keep the saddle in place. Ponies often have to wear a crupper as they tend to be very round and lacking in withers which can cause the saddle to slide forward onto the neck. A Cantle or Pommel bag is a great piece of trail riding tack. A cantle bag is a small bag that fastens to the part of the back of the saddle. A pommel bag is just the opposite, it attaches across the horn of a western saddle, or attaches to the front of an English saddle near the front or pommel, hence the name. These handy little bags hold useful things out on long rides; lunch, water bottles, hoof picks, car keys, and cameras. Although you can use your regular tack on the trail, when trail riding more extensively you will want to invest in some basic trail riding tack. It will make your time on the trail with your horse much more pleasant, safe and comfortable. Horse Training Tips- Enjoy these training tips that you can use both in the arena and on the trails. Horseback Riding Books- Need a good read to give you more information about trail riding or other horse related subjects? This article goes over some of the popular categories of horse related books.